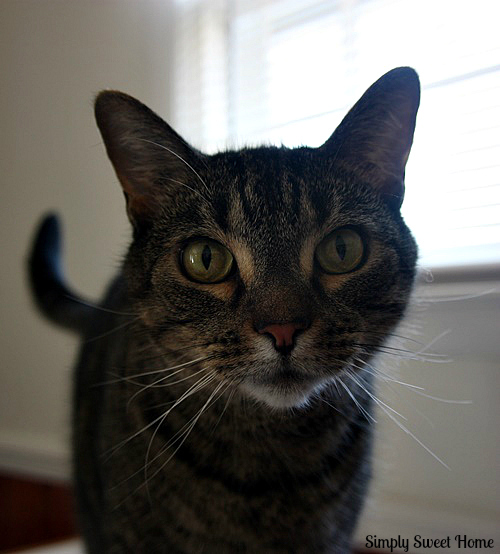 When I’m not blogging, I am a full time Cat Mommy and part time member of the Cat Paparazzi! Anyone who knows me knows I’m in love with my cats, and they pretty much run the show here! 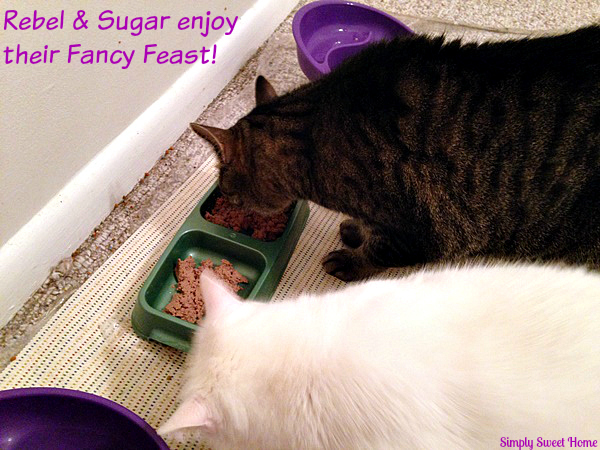 For those of you aren’t familiar with the Simply Sweet Home cats, let me introduce you! First we have Rebel, the handsome man cat! (Hello Rebel!) Rebel is almost 7 years old. 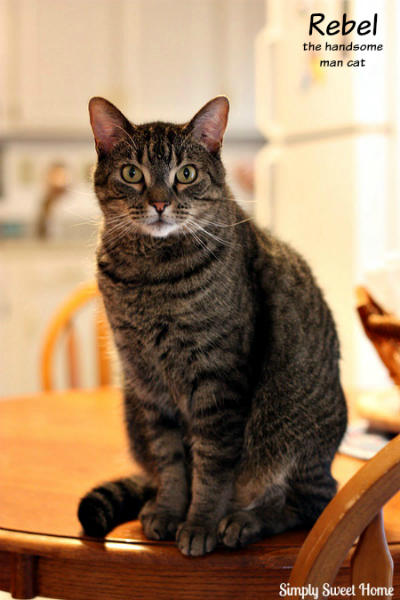 He’s a very sweet and sociable cat who loves to be petted (in moderation, of course). He loves to “sing” and drum on random objects throughout the house, and he’s a great foot warmer on cold nights! 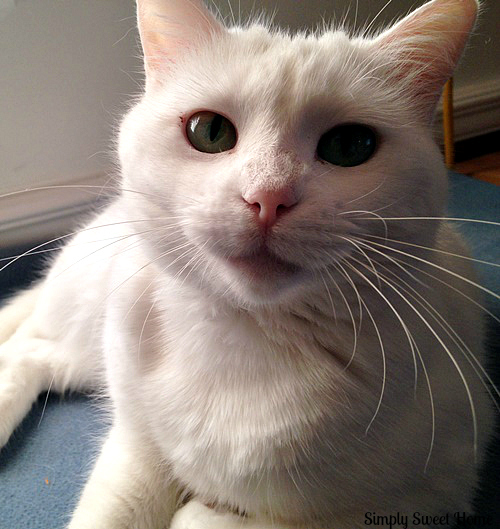 Then there’s Sugar Belle, the princess cat (aka – Miss Pretty). 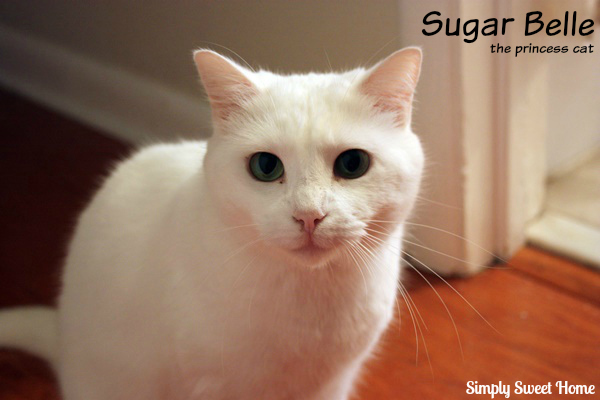 Sugar is 3 years old. She is such a loving and playful cat and snuggle partner. And although she’s shy around all other people in the world except me, she has no trouble showing Rebel and our dog Shadow that she is the boss (and she has some mad ninja skills). When you really love your fur babies, you put a lot in to their care! Here are just a few ways I (and you) can show the cat-kids some love! 1. First and foremost, give your cat great food and treats. In our household, canned food day is an oh-so-special day! 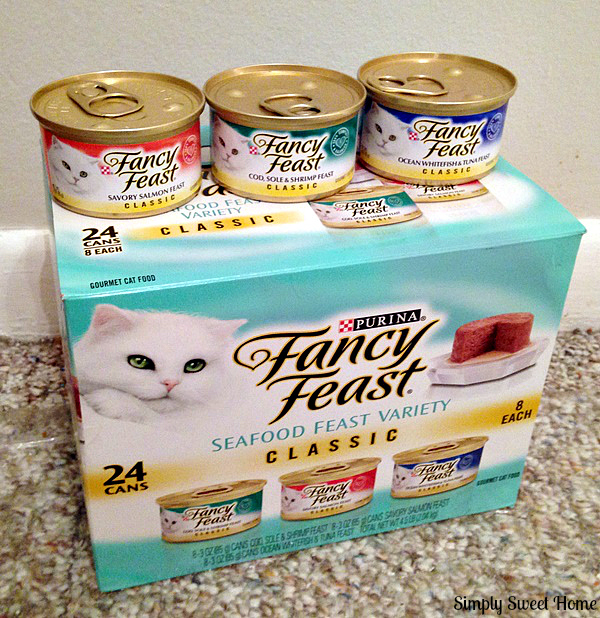 Purina Fancy Feast has several varieties my cats just love! And the products are made with high quality proteins and ingredients, so we can feel good about serving it to our cats! 2. Give the cats furniture and/or space in your home. Cats actually NEED to scratch, so a scratch post or pad is a must! It’s also good to give your cat some type of cat tree or other item to climb and jump on, and they also need a place to sit and sleep. If you live in a small apartment and don’t have room for all these things or if you have certain areas of your house you just don’t want your cats to use, I recommend finding/making desirable places where your cat CAN be. For example, I’m always at my desk working and the cats naturally gravitate to where I am, so I’ve placed a few blankets in cat-friendly areas on and near my desk. The blankets are very soft and inviting to them; plus I’ve placed them in both high and low places (to fit their every mood). 5. Scoop the box regularly and use Litter Genie to eliminate odors. Cats love a clean box, so scoop your box daily and change your litter out completely on a regular basis. And get a Litter Genie! Scooping the litter box is my least favorite cat related chore. (Isn’t it everyone’s?) But the Litter Genie makes it a little easier. Basically with the Litter Genie, you can scoop your litter box each day, but you can skip the daily bagging and the daily trip to the trash for up to 2 weeks, because it let’s you store the waste that you scoop and locks in the odors in until you are ready to throw the bag away. First you’ll need to open the Litter Genie at the middle (as shown above). Then attach your scoop holder. Close and place your scoop inside the scoop holder. 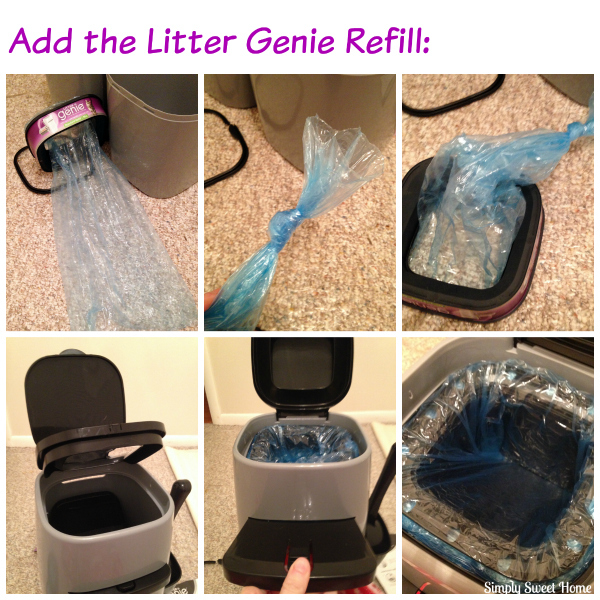 Then add your Litter Genie Refill. To do this, take the refill. (You’ll find it inside the Litter Genie.) Pull the ring off the top of it. The pull out about a foot of the blue plastic. Pull it through the center and tie a knot. 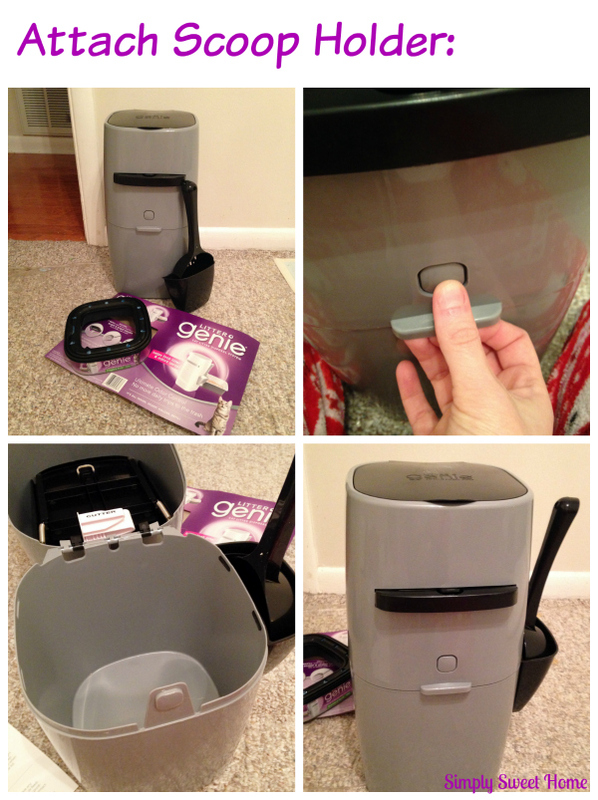 Open the top of the Litter Genie as shown above and place refill inside . Pull the center flap out (as shown in the bottom-middle photo above). This will allow you to push the plastic all the way to the bottom. C;ose your lid. 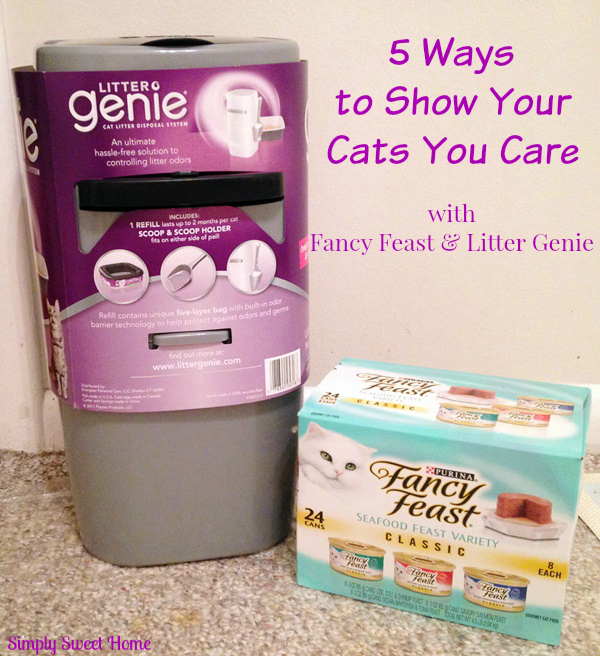 Now your ready to place the Litter Genie next to your litter box. 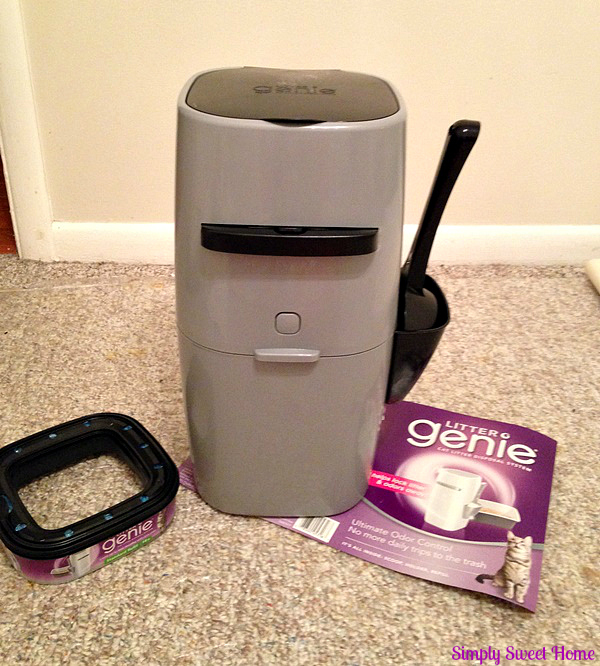 Scoop your litter box and place litter and waste inside the Litter Genie. When you are finished scopping, pull out the center flap. This will allow the litter to sink down to the bottom of the Litter Genie, locking in odors so you won’t have to smell it next time you open it up to scoop. When you’re ready to empty, just open the Litter Genie at the Center. You’ll find a cutter inside that will allow you to cut the plastic bag at the top. Upon cutting the plastic, just tie a knot at the top of your full bag of litter. 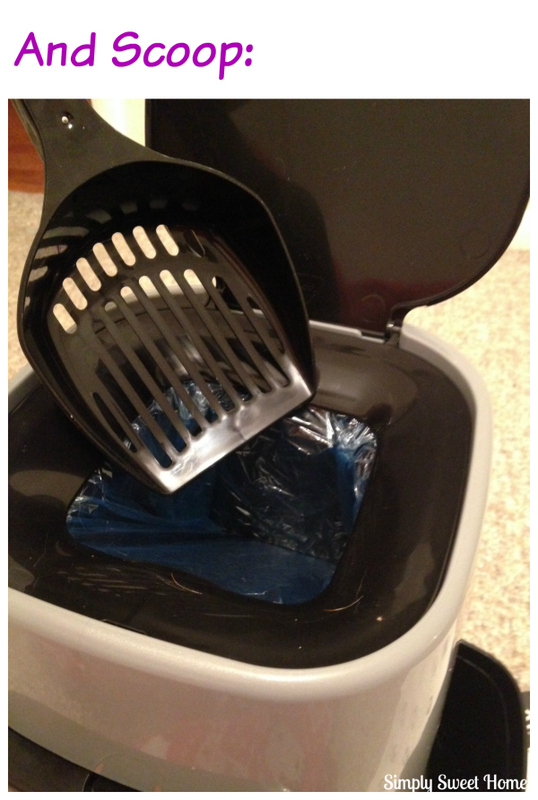 Then use your refill to make a new “litter bag” repeating the process described above. Offer at Target! I bought my Litter Genie and Fancy Feast Cat food from Target. Right now they have a great promotion going. And you can choose a bag of Friskies Party Mix cat treats or a specially marked cat toy for FREE, while supplies last. Offer lasts now through February 15 through April 11, 2015. Want more product information and updates? How do you show you cats love? Comment here!